Being consistent in actions for your goals in life can be the difference between success and failure. If you search for the reasons why people fail, the list carries on and on. One way to look at the difference between success and failure is the amount of required consistent action that took place. When challenges overcome your ability to adapt to them because not enough consistent action was taken, failure can be more likely to occur. Failure can be defined as the lack of success or the omission of expected or required action. So, the required consistent action to overcome a challenge, inevitably, can produce results that lead towards success and away from failure. In fact, through providing hundreds of thousands of chiropractic adjustments throughout my years in practice, I’ve learned how vital overcoming challenges is in succeeding in life. The act of helping thousands of people make small alterations to achieve their desired result has created a level of certainty about the power of overcoming challenges that resides in all of us. 1. Let those challenges change and shape you to conform to the average. 2. Make changes to achieve a higher potential than the challenge so those challenges help you grow. Investing into your quality of life so you can overcome the demands and challenges of today’s world is for everyone, regardless of where you are right now. You can substitute the word “Income” and replace it with overcoming challenges. Jim Rohn is saying if you want to see change take place around you, you need to change who you are. Personal development is in all areas of life and it starts and ends with the amount of consistent action taking place. 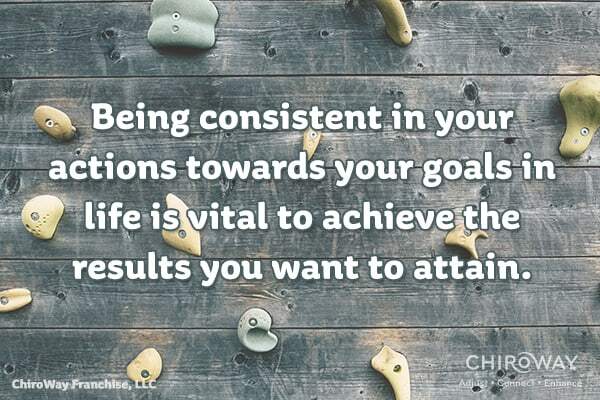 Being consistent in your actions for your goals in life is vital for the results you want to attain.